a cold handcrafted beer, salty popcorn, kick off my shoes, and stretch out on one of their super comfy couches..
get lost inside someone else's story on the big screen for a while. and a true pleasure to introduce to others.. local friends/family who have never been; friends/family visiting from out of town..
people whose only movie theater experience involves cramped rows of seats squished write next to each other..
to suddenly have some elbow r o o m.. a couch, sofa, with not just a narrow arm rest with a cupholder.. but a table! for your drinks..
which can include wine or beer or soda, water..
and where you can have restaurant food delivered..
it almost doesn't matter which movie is playing the experience is so good..
but it was a good movie too. Mr Holm's. /which I can only seem to say and hear in a way that plays off of the popular classic song: Mrs Jones. " 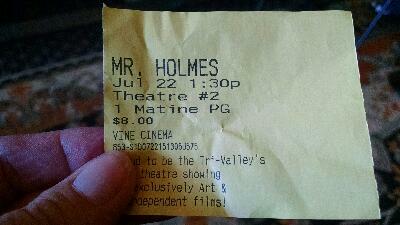 ... me and Mr holmes, Mr Holmes, Mr Holmes..
we've got a thing... going on... Da, dut, da dut, da... "
anyway: if they had to do it over again.. my mom, my aunt and friends.. they would have lunch first, somewhere in downtown Livermore, and then just have drinks/popcorn in the theatre. -because although the food itself was good.. and the seats comfortable, and the tables convenient. -they found it hard to eat in the dark. /and it is, but may I personally highly recommend zephyrs blue~cheese bacon burger. -which was delicious and sustained me from this afternoon movie all the way until breakfast the next day.